& Wall Mount Fish Tanks! Red Sea MAX Aquariums are complete “Plug & Play” Coral Reef Aquarium Systems. No more spending hours researching what you need to establish and maintain a pristine Marine Reef Tank. Red Sea Max takes all the guess work out of the game. The MAX 4-stage reef filtration system including an adjustable height protein skimmer will satisfy even the most critical Nano Reef aficionado. Red Max's contoured contemporary cabinets have ample room for a water chiller. Its fan cooled hoods provides the perfect combination of T-5 Linear day lighting. Actinic lighting helps your reef inhabitants stay active and healthy. Blue LED moonlighting provides subdued evening viewing. Reef Tanks are available in 29 & 65 gallon models. These are not your typical fish fish tanks. Red Sea Max is Marine Reef Tank Ownership Made EZ! Clear for Life UniQuariums were engineered with simplicity in mind. Their self-contained 3-in-1 filtration system appeals to the novice aquarist while living up to the demands of serious Saltwater Aquarium owners. UniQuariums come in a vast variety of shapes and sizes including flat back hex, true hexagon, corner pentagon, tube, cube and the traditional rectangular aquarium. Fish tank volume ranges from 10 to a whopping 300 gallons! 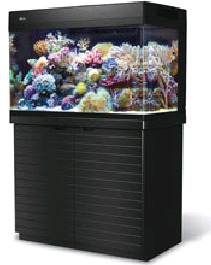 UniQuarium fish fish tanks can be purchased as a standalone tank or outfitted with matching acrylic hood & canopy sets to transform them into ultra-sleek, contemporary floor standing aquarium. MidWest Tropical was the premiere manufacturer of Designer Fish Fish Tanks. Their Designer Series, AquaVisions, and AquaTower Aquariums introduced the world to a whole new spectrum of aquarium ownership. MidWest Tropical’s AquaTable Aquarium Tables changed the way we view aquariums forever. 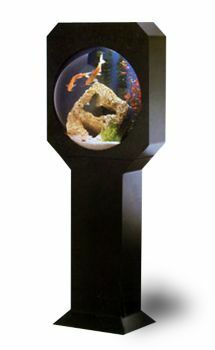 AquaTower Aquariums set a new mark in aquarium design. AquaTowers are space saving column aquariums. These fish fish tanks compact horizontal footprints allows them to fit virtually anywhere in a home or office workspace while their sheer presence is sure to make them an instant conversation piece. 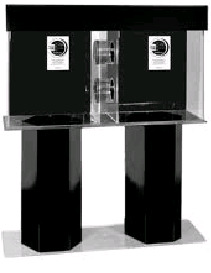 These-self contained column aquariums come complete with a high capacity under-gravel filtration and air pump unit. 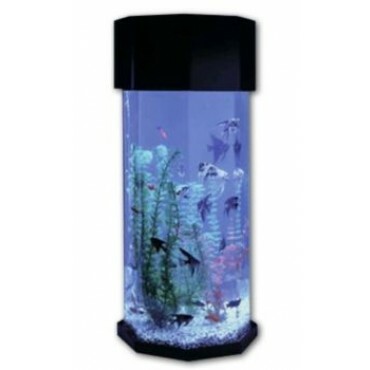 AquaTower Fish Fish Tanks are available in octagon, hexagon, pentagon, triangle and square models. Aquarium capacity ranges from 20 to 55 gallons. AquaVision Dome Aquariums are some of the most unique fish fish tanks Exotic-Aquariums carries. Just gazing into one of these Acrylic Bubble Aquariums is absolutely mesmerizing. It’s like looking at the underwater world through the eyes of a fish! A combination of 3-stage canister filtration and under-gravel filtration keeps these bubble tanks crystal clear. 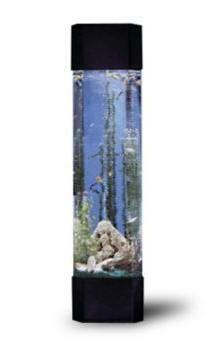 AquaVision Fish Fish Tanks come in 12, 25 & 30 gallon models. MidWest Tropicals Designer Series Aquariums broke the mold of the traditional rectangle aquarium. Designer Series models come in single or double domed porthole, corner pentagon, the Panorama semi-circle or Shadowbox pentagon. Tanks sizes range from 25 to 50 gallons. Designer models also come complete with both 3-stage canister and under-gravel filtration. 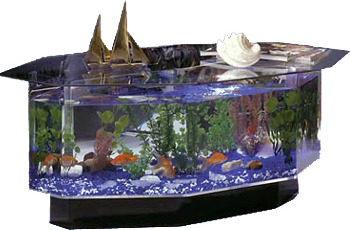 Aquatables are the original Aquarium Table Fish Fish Tanks. This was one of MidWest Tropical’s most innovative designs in a world where everyone thought an aquarium had to be rectangular. 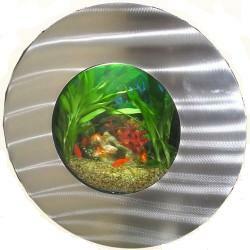 One of the most revolutionary concepts behind the Aquarium Table is its lighting. AquaTables come with transparent blue glass gravel. The Aquarium Table is lit from the base allowing the illumination to come up from the bottom of the tank. 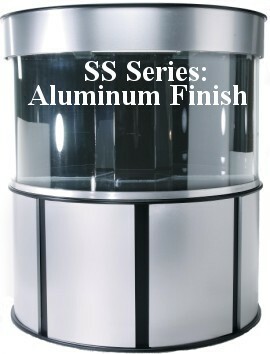 All Aquarium Table models come equipped with 2-stage under-gravel canister filtration. These fish fish tanks feature 3/8 inch tempered glass tops to insure maximum safety and longevity. Coffee Table Aquariums come in square, octagon and elongated octagon. End Table Fish Fish Tanks are square. Tank capacity ranges from 15 to 40 gallons. All Midwest Tropical Aquariums Tanks make excellent Freshwater Fish Fish Tanks. The AquaVision & Designer Series have ample filtration for use as a Saltwater Aquarium. A heater is recommended for Saltwater Tank use. Aquarium heaters can be purchased at any neighborhood PetCo. Saltwater Fish Tank & Marine Reef Aquarium Packages. The Right Fish Tank Aquariums at the Right Price!